I nearly quit everything to go home two months ago. And when I say nearly, I mean that I actually purchased a flight from Bangkok to Montreal and I was two days away from boarding the plane when I came to my senses and aborted this crazy plan. I was about to give up my current life I’ve worked so hard for, my dreams of becoming location independent and this blog I have put all this work into but has given me more than I could imagine in return. I just could not sit on my own with my pain in this crappy hotel room in the middle of Thailand any longer. I was lost. Becoming a solo traveler was not something I had ever anticipated or wished for… and obviously neither was letting go of my ten year relationship. Thus went my brutal return from a magical six weeks in India, leaving an empty shell of me. 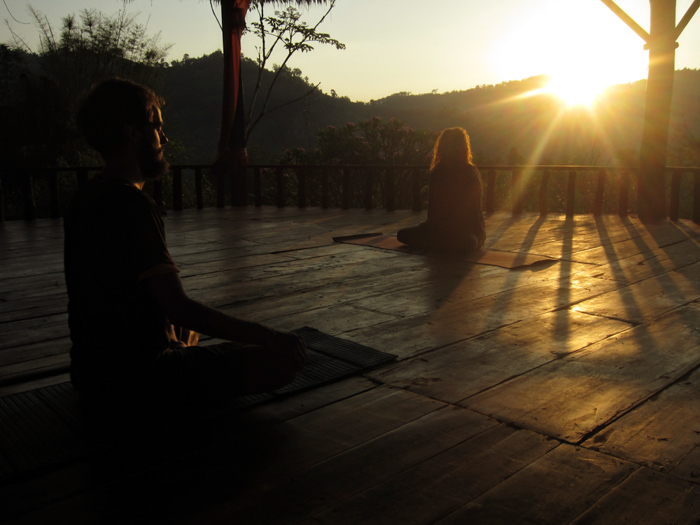 Salvation came in the form of two girlfriends I had met in India inviting me to join them for a two week long Thai massage course in a hill tribe village in Northern Thailand. Touching clammy strangers in questionable fashions and learning to crack vertebras with little regards to health and safety – what better redemption program could there be for my broken heart? Well… There was none, there’s a bonus entry for you. Day one, and we all meet at the Sunshine Network headquarter in Chiang Mai where we are loaded in the back of a pick-up truck like some illegal workers for a two-hour drive up the mountain in the merciless midday sun. I felt grumpy from the get go and definitely wasn’t in the mood for mingling with any of these strangers I was just about to get way too up-close and personal with. 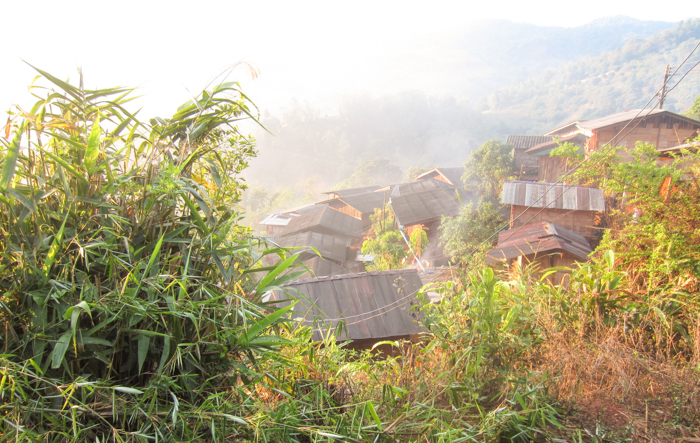 The Lahu hill tribe village, where the course was held, was bare bone. We were dispatched into little prison cells wood huts with a camping mattress right onto the floor for a bed where I assumed fetal pose upon arrival and resumed with my favourite activity of the previous two weeks: being miserable. And little did I know things were about to get worse. But more often than not, I was staring in disbelief at all the blissful shut-eyed faces basking in the morning glow around me, watching them sway left and right as they chanted, wondering what could have possibly gone so wrong in my life that I’d ended up in this crazy place from hell. People bloody swaying. This damn course I was expecting to be a retreat from real life was deceptively hard, let alone the fact that I was not in a very good place to begin with and that hours of daily massage is conductive to the release of bad emotions. So I cried. A lot. I couldn’t even try to begin to hide away my pain, as it was just spewing out of me like unwelcome sour milk out of a replete baby. I attended the daily 6am meditation, yoga class and chanting merely to escape the deafening rackets of the pigs and roosters, and I was surprised when I found myself able to relinquish my current life situation and immerse myself into the stillness of the moment once or twice. But more often than not, I was staring in disbelief at all the blissful shut-eyed faces basking in the morning glow around me, watching them sway left and right as they chanted, wondering what could have possibly gone so wrong in my life that I’d ended up in this crazy place from hell. People bloody swaying. But one morning, something shifted. After finishing yoga class and spending an hour crying on my mat while our instructor Luis generously held me (the people in my group turned out to be godsent freaking angels), I got up, as if suddenly struck by a ray of enlightenment, and felt at peace. All of the sour milk had been spewed out. I feel as though the act of selflessly giving massage upon massage and the emotional release from receiving them had nurtured and healed my heart on fast forward. I started seeing these people I was living in close proximity to in a new light, realizing how amazing their own journeys were, and finding so much solace in each and every one of them. I stared in the eyes of a German man one morning and did not shrink back in fear of letting another being in onto the mess that I was. In his intense dark green gaze, I saw reflected back all the possibilities life afforded me at that very moment. I no longer felt like an empty shell as life was suddenly full of promises and opportunities. The world was my oyster to explore, and only mine. What a beautiful realization. I realize this is not a very objective review of the Sunshine Network. My initial perception of it was overshadowed by my heartache and it took me a few days to start appreciating my surroundings. Sunshine Network is an absolutely incredible school and it helped me heal myself in a way I had never thought possible. 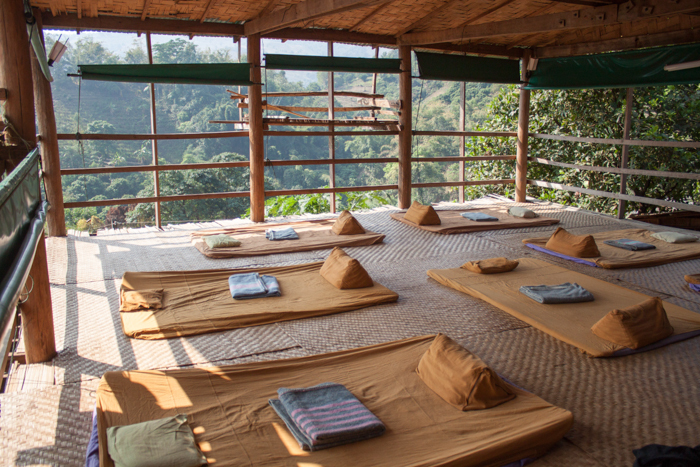 The Lahu village, although very rustic, is a beautiful natural environment in which to learn and let go and the view from the massage platform is simply breathtaking. We were served a delicious, nourishing, carb-heavy, sticky rice based, fully vegan menu daily with unlimited ginger tea and lots of fruits and vegetables. The quality of the instruction was stellar and, despite the horrible state I was in on arrival, I left with enough knowledge and feedback to be able to provide a two hour Thai massage, which has turned out to be an excellent tool to connect with new people on the road. It truly was an incredible experience. This entry was posted in Asia, Thailand, Travel on July 20, 2015 by Amélie. “Time will heal everything” but it’s even better if you can speed it up! 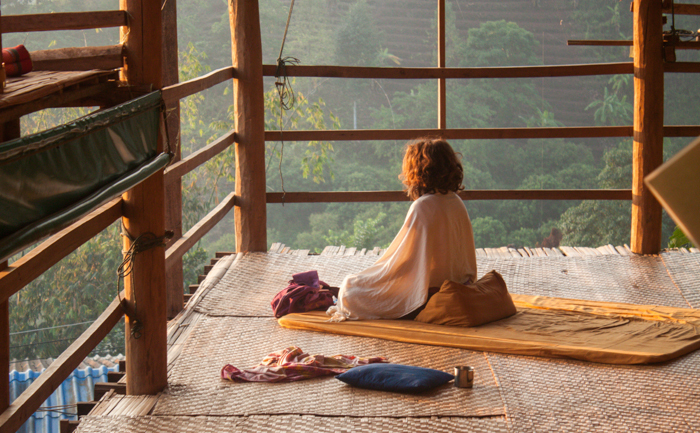 Breathtaking photos, makes me miss Chiang-Mai loads! Incredible post, Amelie. Happy to hear that it helped in the end. My name is Heidi…….thank you for posting exactly what i needed to read in this moment…. How are you ? what exciting changes has your life taken? Are you working and living your purpose? I spoke with my husband this morning over breakfast and had read your post and was still open to the possibility of going to the sunshine network…. wahoooo…..
thanks once again for your open account..